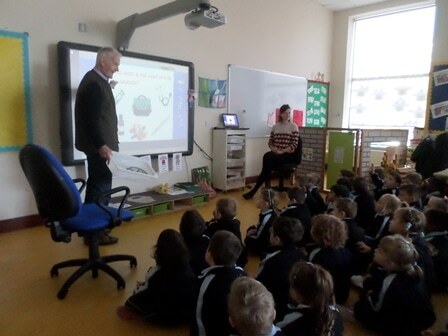 The Junior Infants had a special visitor in last week… a Vet! Dr. Hugh showed the children lots of pictures of the different types of animals he treats, and explained some of the ways he helps to make them better when they are sick. The Junior Infants asked him lots of great questions, such as how do you become a vet, and how can they care for and help animals. Dr. Hugh showed the children some of the special equipment he uses to help animals, such as a stethoscope, and asked the children to mind and care for two pet goldfish for him- they must feed them, clean their water, and make sure they have enough air and light to be healthy and grow. The fish are in Room 2 – feel free to pop in to see how they are getting on 🙂 For more photos of the Junior Infants from Rooms 1, 2 and 5, please see here.